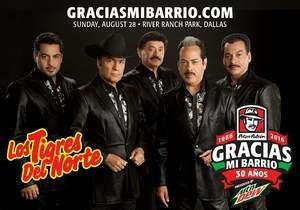 DALLAS, TX--(Marketwired - Aug 11, 2016) - Pizza Patrón will celebrate its 30th anniversary by hosting its 'Gracias mi Barrio' (Thanks to the community) concert event presented by Mountain Dew on Sunday, August 28th. The festival will be headlined by Grammy Award winning artists Los Tigres Del Norte, ranked highly among "The 30 Most Influential Latin Artists of All Time" by Billboard magazine. The celebration will be held just a few miles from the original Pizza Patrón store and is expected to be one of the largest ever held at River Ranch Texas Horse Park, a city of Dallas property located at 201 Pemberton Hill Rd, Dallas, TX 75217. Entertainment throughout the day will also include Palmares de Ojinaga, Ases y Reyes, Banda Vientos de Guanajuato and DJ Layla. Pizza Patrón is making this event free and parking free as a thank you to its customers for 30 years of success. Tickets are available, one per person while supplies last, starting on Monday, Aug. 15th at all Pizza Patrón locations in Dallas, Fort Worth, Austin, Houston, and San Antonio. "Hosting this event is a dream come true for us and true to the Latin culture, we can't think of a better way to say thank you than to have a fiesta," said Antonio Swad, company founder. "Pizza Patrón is much more than just a place to buy a pizza. Our company has been, and will continue to be, the living embodiment of hope and opportunity for people throughout the years. Pizza Patrón is a brand that belongs to the community. Our customers have seen us through challenge and controversy. They have our back and we have theirs. Who else can say that?" The 30th Anniversary event is presented by Mountain Dew and sponsored by Bud Light, Univision 23, 49 Unimás, Qué Buena 94.1, La Jeffa 99.1, Gomez Western Wear, Jack Daniels, el Jimador Tequila, metroPCS, State Farm, Supermercado El Rancho, and the law offices of Domingo Garcia. For more information about the event, visit graciasmibarrio.com. For more details regarding Pizza Patrón franchise opportunities, please contact franchise sales manager Isaiah Melendez directly at 972-982-0176 or visit ownapizzapatrón.com. To find the nearest Pizza Patrón location, go to www.pizzapatron.com.